Has anyone else noticed that when Chef, Cartman, Cartman's mom, Stan, and Kyle are in the John Edward show, between Chef and Leanne Cartman you can see an alien. I wonder they hid an alien in every season 6 episode, or maybe in every episode of every season. 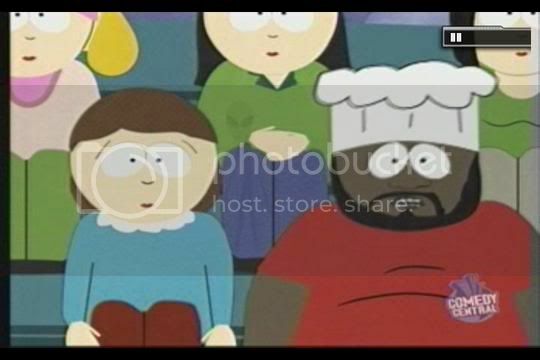 daredsox04 wrote: Has anyone else noticed that when Chef, Cartman, Cartman's mom, Stan, and Kyle are in the John Edward show, between Chef and Leanne Cartman you can see an alien. I didnt even notice when i watched it. Hey i noticed that when John Edward's addresses Kyle about his grandmother he did not hear Kyle's name beforehand did any one else notice that, this might have been explained when Stan sid the audience was wired, but there was a bit of a gap between those two points. Awww, a blooper has already been found. I was going to say I noticed that Stan was talking to John Edwards in what was the Jew school on the outside but his house on the inside! Just noticed that when it was on TV last week. I thought, hheeeyyy, aren't they supposed to be in New York still? I came online JUST to mention this haha. I was so excited because it was the first Visitor I'd actually seen for myself without already being told about it. I think that this has to be one of my favourite episodes of all time, just pure brilliance! It was the heat of the moment..
i found another one: the guy in the last scene of john edward vs. stan's audience, which has an orange shirt and a moustache appears in the beginning of the next scene, when chef, cartman, and her mom come out of the airport, you can see the guy at the left. In "Chef Aid" Chef's last name is revealed to be McElroy but the nametag on the pot roast says "McGillroy". Anyone else notice this?